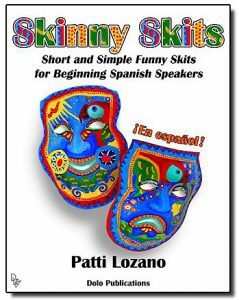 The Skinny Skits book by Patti Lozano is a 152-page book with a delightful assortment of 45 skits that reinforce conversational topics through role-play. The skit topics are loosely connected to vocabulary themes learned in Year 1 Spanish. Each Act contains three skits of graduated length and complexity. 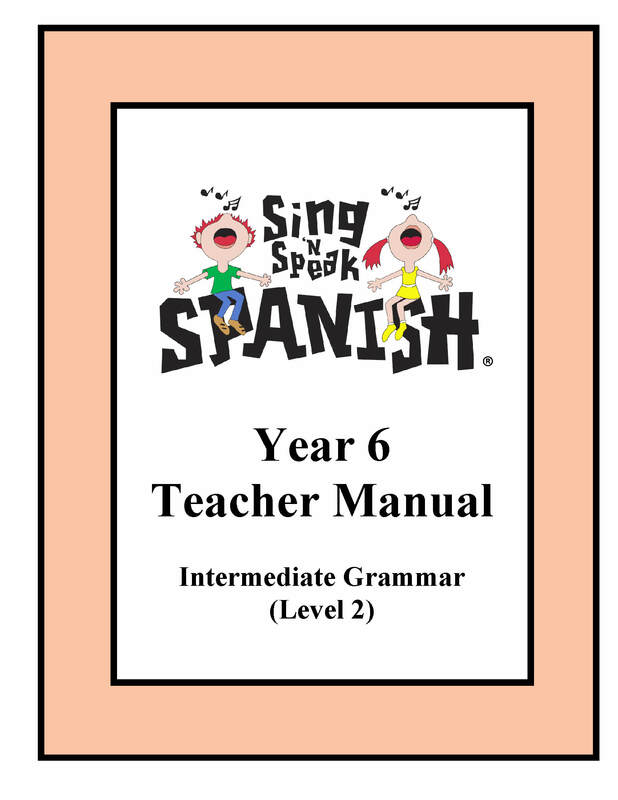 The Sing ‘n Speak Spanish Year 6 Manual includes 44 lesson plans which equate to approximately 88 hours of instruction. 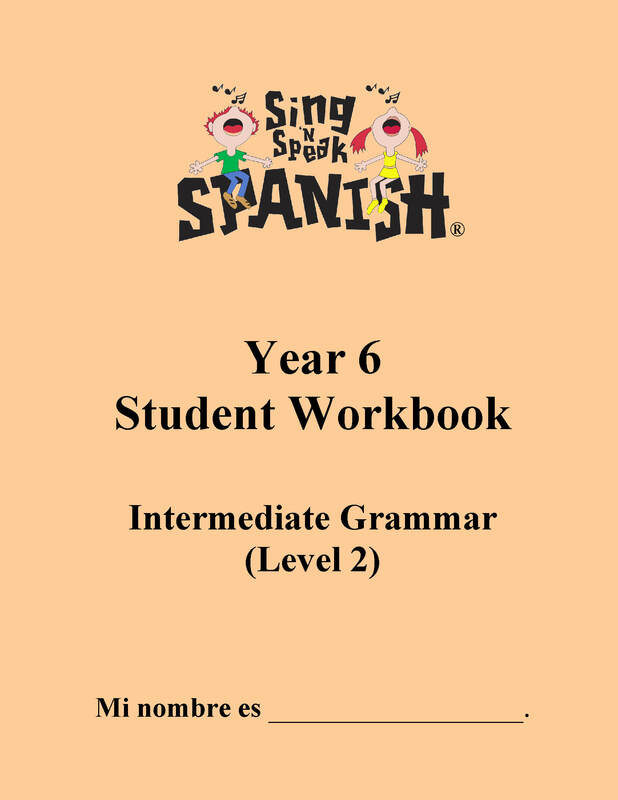 The 168 page Sing ‘n Speak Spanish Year 6 Student Workbook includes sentence-based vocabulary sheets, numerous writing exercises, puzzles, discussion questions, an Answer Key, and much more. These three products work together perfectly as a Year 6 curriculum for the Sing ‘n Speak Spanish program. Year 6 Spanish introduces the student to an enormous amount of new vocabulary and quite a few grammar concepts. Although the skits are written in the present tense, the manual and workbook place a huge emphasis on the use of the preterite tense with regular, irregular, and reflexive verbs. Other grammar themes include possessive adjectives, definite/indefinite articles, singular and plural commands, cardinal numbers, questions words, diminutives, direct and indirect object pronouns, and more. 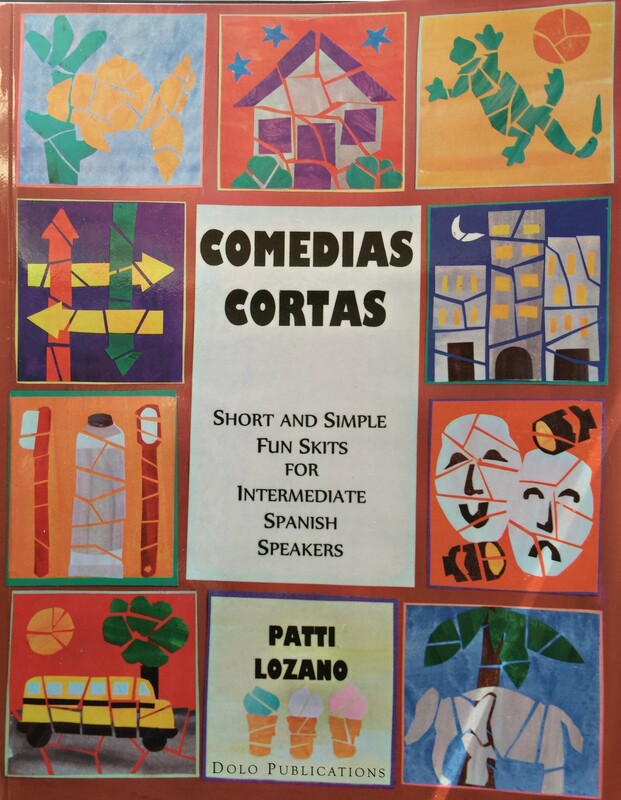 The Comedias Cortas book by Patti Lozano is a 154-page book with a delightful assortment of 33 skits that reinforce conversational topics through role-play. The skit topics are loosely connected to vocabulary themes learned in Year 2 Spanish. Each Act contains three skits of graduated length and complexity. 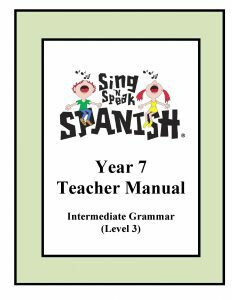 The Sing ‘n Speak Spanish Year 7 Manual includes 33 full lesson plans which equate to approximately 66 hours of instruction. 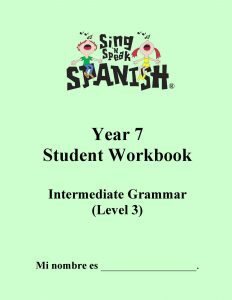 The 173 page Sing ‘n Speak Spanish Year 7 Student Workbook includes sentence-based vocabulary sheets, numerous writing exercises, puzzles, discussion questions, an Answer Key, and much more. These three products work together nicely as a Year 7 curriculum for the Sing ‘n Speak Spanish program. Year 7 Spanish introduces the student to an enormous amount of new vocabulary and quite a few grammar concepts. Although the skits are written in the present tense, the manual and workbook review or introduce verb conjugation of regular, irregular, and reflexive verbs in numerous tenses: present, preterite, future, present perfect, conditional, imperfect, and affirmative and negative commands. Other grammar themes include comparative and superlative adjectives, additional helper verbs such as deber, acabar de, volver a,direct and indirect object pronouns, and more. 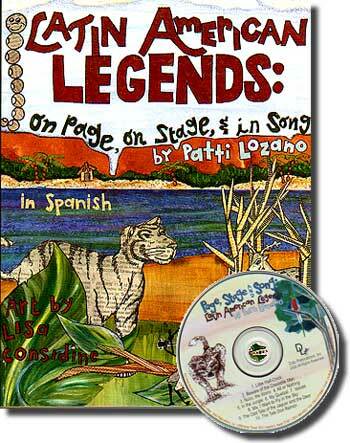 Latin American Legends by Patti Lozano is a 154-page book with ten entertaining legends and songs from Latin America for late beginning and/or intermediate students. Each legend is preceded by fun and innovative activities to use in the classroom once the song and story are familiar to the students. Most of the prose is in the present tense, but there is some use of the past, conditional, imperative, imperfect, and future tenses when necessary for clarity. The Student Workbook, created by Sing ‘n Speak Spanish, is a 95-page workbook with many sentence-based vocabulary sheets, numerous writing exercises, puzzles, discussion questions, an Answer Key, and more. 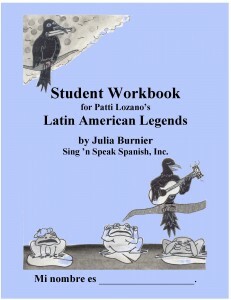 The Latin American Legends book and Workbook work perfectly as a supplement for students taking Year 6 or Year 7 of the Sing ‘n Speak Spanish program. Students who complete Year 5 Spanish are ready to read and discuss more complex stories that introduce new vocabulary and grammar while reinforcing what they have learned in previous years of instruction. Each legend is divided into three or four sessions for a total of about 34 one-hour lessons. 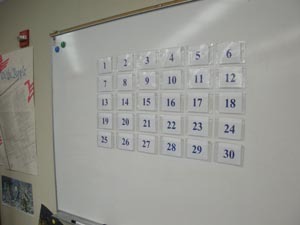 The set of 30 Numbered Magnetic Pockets allows the classroom teacher to easily display game cards on a magnetic classroom whiteboard to play a variety of games – such as flyswatter, silly sentence, or concentration games. 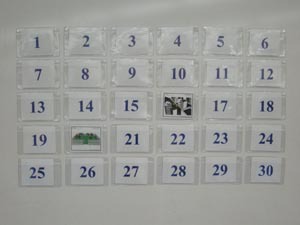 The game card pockets are light, versatile, durable, and convenient to stack and carry from classroom to classroom. They are included in each of the Teacher Packages. If you need additional pockets, these are available for purchase.